...the final hummingbird of the year! Rufus is named simply "Rufus" as chosen by his mama. She's a very thoughtful mama, this mama. I know her bits of personality, though we are separated by an ocean and some land and we have never met face to face. We're kindred spirits, Rufus' mama and I. And I think she thinks a lot like I do. Sometimes the best and most sentimental things are named just for what they are. The only toy I have today from childhood is a tiny bear given to me when I was four. His name is simply "Bear." My son's most favorite stuffed animal is a little frog that he holds so dear to his heart and in his arms, round the clock. The frog's name is "Frog." I am sure there is someone in your household whose name is simply "as is." 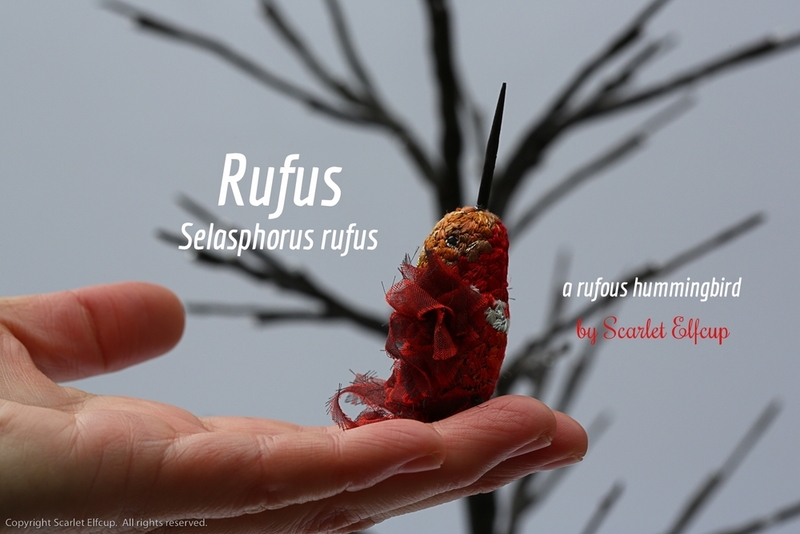 Rufus is named for his hummingbird species, Selasphorus rufus. 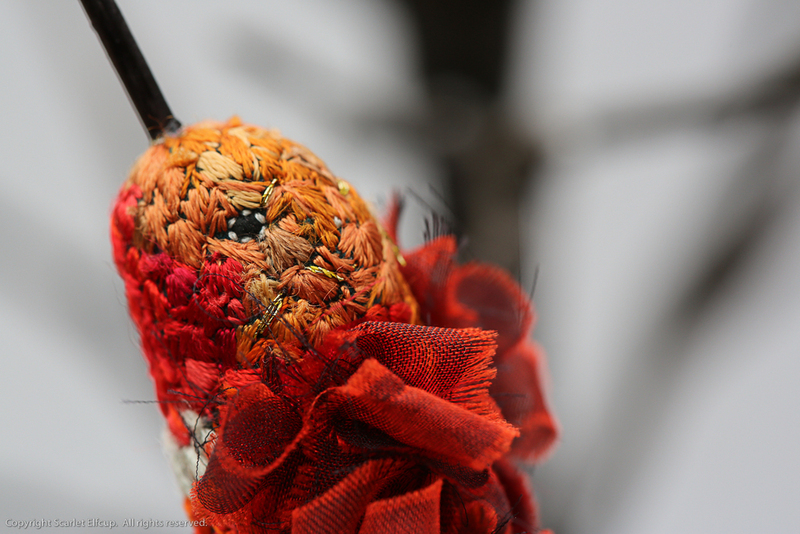 This particular species of hummingbird is known for being the feistiest of all the North American hummingbirds. They can defeat even the larger hummingbirds, some of which are double their size. The rufous hummingbird is also known for their extraordinary flight abilities, flying as far as 2000 miles during migration. Rufus' name also coincidentally is related to the Biblical persona, Rufus, whom the Romans compelled to carry the cross on which Jesus Christ was crucified. Although Rufus' coming to life at this time of year was pure coincidence, he has surely done well in representing the celebration of the holidays. 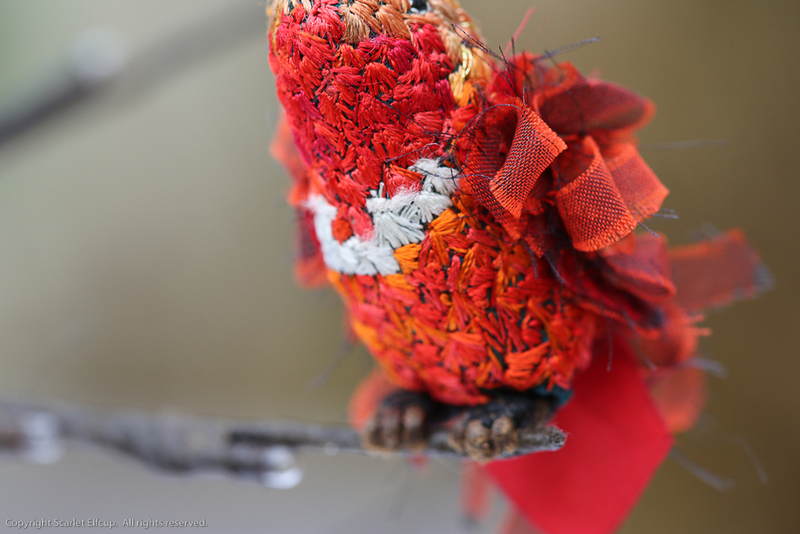 Rufus was inspired by a mama who wanted a hummingbird made with crimson red and burnt orange colors so that she may enjoy the beauty of the holiday season. Henceforth, came a creation modeled after a real life species who also carries with him a name that represents a story for Christmas time. How beautifully it all coincidentally came together! Rufus' body is made from mud silk. On top of the mud silk, Rufus' body is decorated with over 1000 stitches of about 15 different shades of embroidery thread. He is stuffed firmly with 100% carded wool. Rufus' wings are hand stitched with strips of of 100% silk. His tail is made from a 100% iridescent silk stitched on top of a 100% silk fabric. Rufus' beak is made from wood, colored with permanent black ink and attached with a tiny dab of industrial strength glue. Despite the industrial strength glue, the beak is still rather delicate because of it's miniscule scale and should be handled with the most gentle hands. In other words, Rufus is not a toy and should not be handled by children. As requested by his mama, Rufus is sprinkled with a small splatter of gold thread on his head to give him a dash of holiday sparkle. At certain angles in the light, one can see the twinkle of gold glimmering through. It is just enough to give him some shine without making him out to be overly-decorated and as a result taking the eye away from all of his other beautiful features. 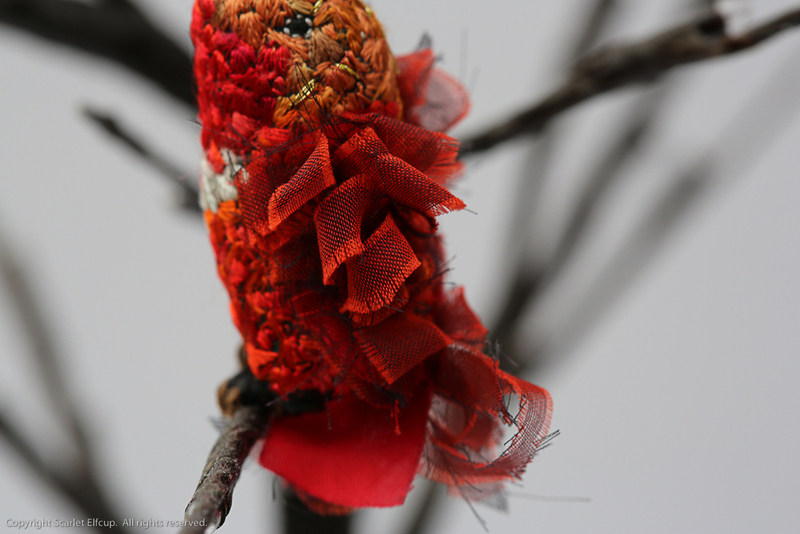 Rufus has tiny taloned toes made with floral wire, wrapped in floral tape and then stitched firmly against the body with thread. The toes will clasp onto small branches when carefully posed and Rufus has the ability to sit prettily by your side without assistance. How nice to have a friend sitting near, in front of a fire with a warm cup of tea!